Tower defense games are one of my favorites to play, and there are always new ones to try. 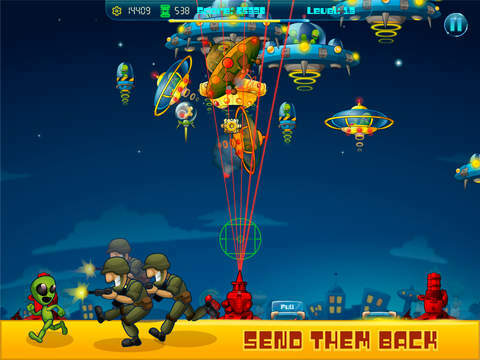 Galactic Missile Defense is a free iOS game by BlackSheep Games that pits players against an alien invasion against Earth in retaliation for landing on Mars. Can you defend your base and your soldiers? Galactic Missile Defense very closely resembles classic games like Space Invaders, mainly because you’re shooting aliens that are descending from the sky. Like similar games, they shoot back and they do so in massive waves. The game is very fast-paced and requires accuracy. Learning how to play Galactic Missile Defense is easy, as the game is fairly straightforward. Your goal is to command three turrets by tapping the sky and shooting spaceships that appear. One of the really nice things about the game is that you don’t have to worry about commanding each turret individually; the turret that’s closest to the target automatically fires. Each turret has its own health bar, and you have to be mindful of it so the turret doesn’t get destroyed. As you play, you’ll earn boosts that serve various purposes like attaching lasers to a turret or repairing your base. I found boosts to be incredibly helpful in prolonging gameplay, as the overall goal of the game is to reach the highest score and level as possible. 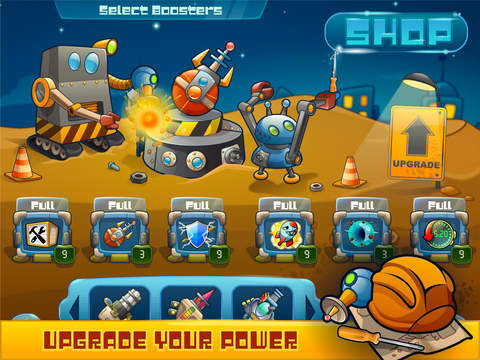 As you play Galactic Missile Defense you’ll earn cogs to spend in the store on boosts. This is a great way to customize your game and use boosts that you find beneficial rather than waiting on random drops. The only thing I’m not a fan of is the fact that in order to purchase plasma in order to perform upgrades on boosts such as extended duration or extra damage. Packs of plasma range in cost from $1.99 for 25 plasma up to $49.99 for 800. Some boosts require a couple plasma for an upgrade, while others cost upwards of 20 plasma for incredibly powerful boosts and weapons. Personally I think extremely powerful and costly upgrades like this take the fun and challenge out of a game like Galactic Missile Defense, but to each their own. Galactic Missile Defense is also supported by ads, but they’re not incredibly annoying or intrusive even though they do pop up fairly frequently. Overall, Galactic Missile Defense is a fun and fast-paced base defense game that does require strategy and quick reflexes. As far as gameplay goes, it’s on par with many of the popular tower defense games available. The only major drawback is a lack of a reasonable turret upgrade system where players don’t have to break the bank in order to fortify their base. On a side note, the developer is also trying to get the game through the Steam Greenlight program. Be sure to check out the page if you enjoy playing Galactic Missile Defense and vote for the game! Galactic Missile Defense requires iOS 5.0 or later and is compatible with iPhone, iPad, and iPod touch. This app is optimized for iPhone 5.